I was going to just make this a note in my regular Zine entry, but it seemed to have enough information to become it’s own story. 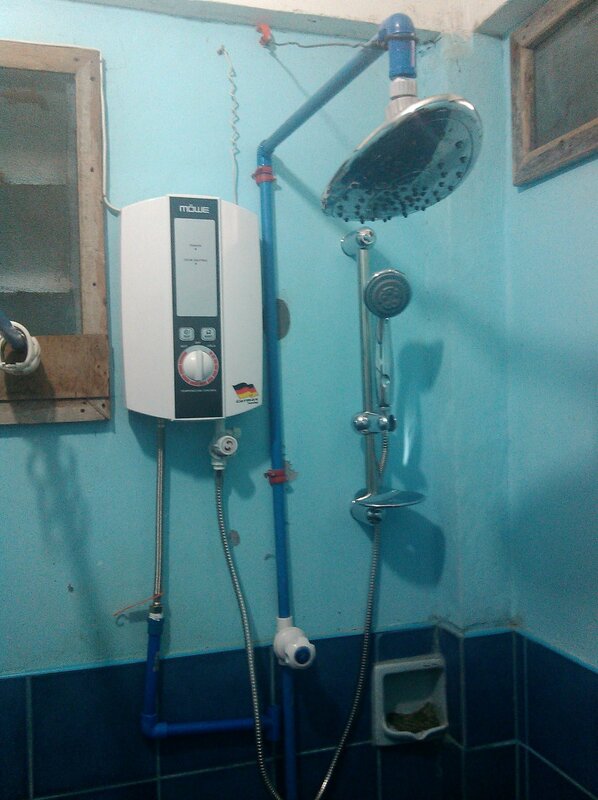 I hope that this will help someone that is also looking to get a hot water heater here in the Philippines. At long last we have decided it’s time to get our hot water heater. This recent cold spell, it got down in the 60’s, had us taking a few cold showers that were actually cold. Normally the water, although not heated, is not really that cold and sometimes even borders on warm. But those few times, it was like showering in ice water. We don’t want to have to go through that again. So Lita and Judith went downtown to look for a reasonable priced one. They went to 2 different stores and got 2 completely different prices. The first store had them for P10,000 (about $225 at the current exchange rate) and the second store they were P7000 (about $157). Both heaters served our need so which one to get was a no brainer. Of course, this being the Philippines, the talked the guy down to P6000 (about $135). They paid and headed home and Victor (Judith’s husband) would go by later to pick it up. It had to be brought over from the warehouse and besides, they did not feel like carrying it. This was morning and, since Filipinos are normally not in a hurry, the part did not make it there until that afternoon. When Victor went to get it he discovered that there is a small problem. The problem being that we told them that we were going to have a certified electrician install the heater for us, but they said that if they did not install it, the warranty would not be any good. Now we’ve always heard that them installing it would cost P2500 ($55), and that is just too much. Since Victor could not make a decision on that, because it’s not his heater, he came back to the house and all 3 of them, Lita, Judith and Victor, went back down there to find out actually what needs to be done to get this heater to our house and installed. As it turns out, when they got there, there was not much of a problem at all. This time they called with an older lady and things just went smoother. 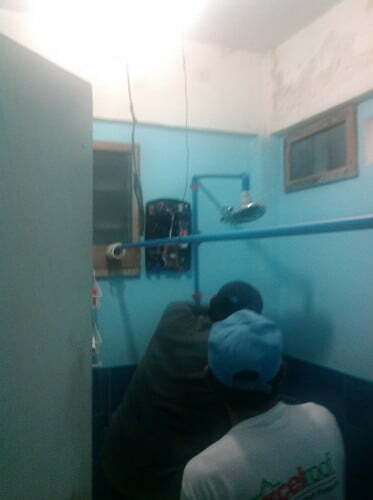 Sure they still want to be the one to install it, but the price to do so is only P1000 ($22). That’s more like what I had in mind to have to pay. It’s probably still a little more than what we could have gotten the other guy to install it for, but this way we don’t have to worry about the warranty being void and it’s not very much more. So the people to install it showed up about 0720 the next morning. No problem, we were up already. They explain things to Lita and she translates for me, all seems okay. This takes longer than I thought it would. They take their lunch break around 1100 and they got back about 1230 to finish it. That’s a normal lunch break here, 1 1/2 hours. They get it finished around 2:30pm and call us in there to check it out and show us how to use it. They said that if we have any problems to be sure to contact the office where we bought it. They cleaned up their mess and left. Now half the relatives want to come by and see this thing. Lita is showing them how to use it because I guess some of them will be taking a shower in there now. She told me that Grace would be, but that’s okay because we are all on the same water and electric bill anyway. I was planning to be the first to take a shower with it, but Lita beat me to it. After her showing everyone how to use it, I had to come in there and adjust it for her. The water does not get hot right away, but it doesn’t take long. I have not had it all the way up to the hottest yet, but I’ll try it when I take my shower later. It will be good to be able to take a hot shower everyday if need be. Maybe it will even actually get us cleaner. We have already told Pam that when it does get installed, she needs to get some of that water and bring it in the kitchen to use on the dishes. I guess Lita will show her how to operate it tomorrow when she comes to work. 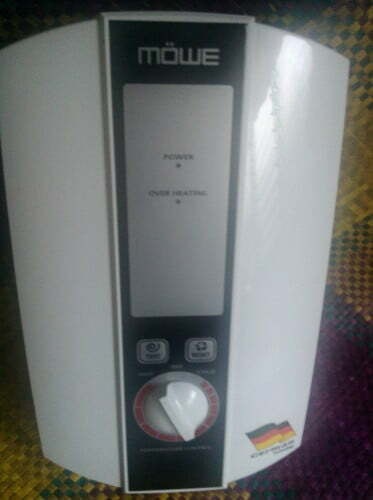 I bought mine 10 years ago 25 gallon Aniston electric water heater at my house in Dagum. They installed the heater similar here in the US. I have my two bathrooms and kitchen hot water ready. I remember i bought it for only 5,000.00 pesos and still works pretty good. Well Bobby I sure hope that ours is as good as the one you have then. Maybe in 10 years I’ll be ready to buy another one. Lots of things to buy between now and then though. Like a printer and some speakers. Thomas I agree with you. If you have been reading lately, then all I should have to say is, “my cell phone”. That just took a couple of Filipinas and their yak yakking to get that resolved though. Works for me. As for repairs though, we have not had a problem, except that cell phone. We had our freezer fixed and it came back better than when it was new. Our fans have a life time warranty on them. If one breaks, the guy fixes them for free, even if we didn’t buy the fan from him. I guess because we did buy so many from him and when we want or need another one, we get it from him too. Anyway, thanks for checking out the blog and most especially thank you for taking the time to send a comment. I haven’t been getting too many recently, but several of the latest ones have been from first time commenters. I hope to see plenty more comments from you on here.